Three years ago today, author Brandon Sneed asked me what the American dream meant to me. Brandon was in the process of writing Behind the Drive: An Honest Story About What It Really Takes to Chase The American Dream, the biography of Kenny Moore, the founder of Hwy 55 Burgers, Shakes, and Fries, and he was asking various people how they viewed the American dream. I’m internet friends with Brandon, so I appreciated him asking my opinion, but I didn’t think he would include my thoughts in his series. And yet, that is exactly what he did. I found it interesting to re-read my thoughts from three years ago. Perhaps most surprising, I still feel the same way now about the American dream as I did then. 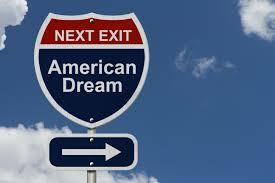 There was a time several years ago when the American Dream for me was getting wealthy. I spent my time chasing money, first in a corporate job and then in a business of my own. At the time, self-satisfaction and self-expression took a back seat to making money. This worked okay for a while, but I felt really empty. I was making good money, but I envied people who were living life on their own terms. These were people who were doing things they loved, but weren’t necessarily making much money. I got to know some of these people and found out that with very few exceptions, they were happier than me. These people had more freedom, lived a more adventurous life, and had stronger relationships with their loved ones even though they weren’t making as much money as I was. It dawned on me, maybe I would be happier if I did something I loved rather than chased money. When I did, I found I had much more freedom and could live the life I wanted to live despite the fact that I was earning substantially less money. For me, this is the American dream. Actually, I’m not sure it is uniquely American. People from all over the world can benefit from this type of lifestyle, but I think it needs to be said that Americans tend to kill themselves earning a living even though they (we) have as many or more lifestyle options as people in any other country on Earth. We have a cultural expectation that values hard work, income maximization and poor lifestyle choices at the expense of health, happiness, and relationships. I’ve chosen to abandon (or at least move away from) this American cultural expectation in favor of chasing my dream of being a writer, being healthier (a work in progress) and above all, being happy. It took me a long time to come to this decision, so I’m starting a little late in life, but when it comes to living a happy, fulfilled life, it’s definitely better late than never.